Jules Maaten walked on confetti of sample ballots and under rows of banderitas of campaign posters on his first activity as Country Director of the Friedrich Naumann Foundation (FNF) Philippine Office. Mr. Maaten was an observer of the Barangay (Village) and Sangguniang Kabataan (Youth Council) elections on 25 October 2010. Mr. Maaten first visited two of the most exclusive villages in Metro Manila, San Lorenzo and Dasmarinas where he was impressed with the organized set up of the voting precincts. He then moved to Makati High School in Poblacion and he was astonished by the crowd at the school entrance – voters checking their names on the list, poll watchers running back and forth, children handing out sample ballots, and those who were simply making predictions on the election results. Going farther in Manuel A. Roxas High School in Sta. 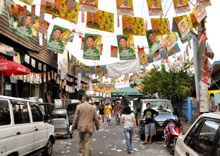 Ana, Manila, Mr. Maaten noted a more subdued yet exciting ambience where people were quietly anticipating the canvassing. “I thoroughly enjoyed the festival-like atmosphere. It was quite unfortunate that there were still reported incidents of vote-buying when we could have hoped that the anti-corruption drive of the government had made its mark. However, this makes me more curious about the election results,” said Mr. Maaten. “There were more voters during the national elections than now because they were thrilled to use the electronic voting machines. But the turn-out is still considerably ok. We attribute this to the fact that our constituents really want change,” observed a poll watcher at the Manual A. Roxas High School. “Our current barangay chairman, because her term has ended, is now running as councilor, similar to how GMA chose to slide from the presidency to the congress,” she added.